Life isn’t going too well for Kris Jenner these days. The momager , who has made millions off of her entire family is now watching her fortune begin to show signs of strain and it’s not sitting well at all. 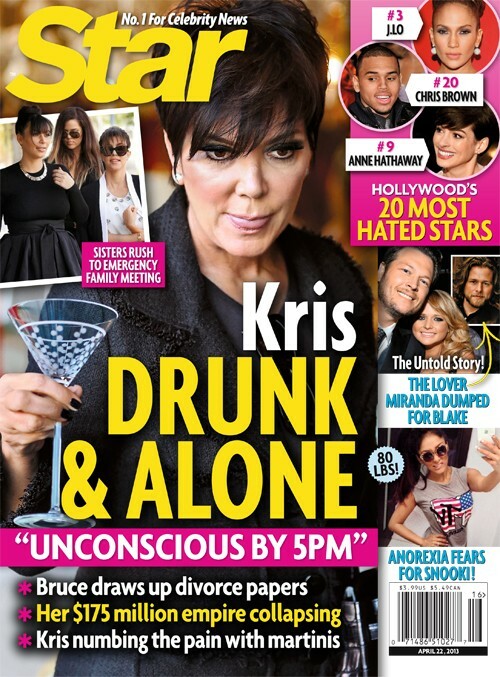 If you remember a few weeks back, Robert Kardashian’s diary was made public and even twenty years ago Kris was quite obviously a fan of hitting the bottle pretty hard. Nowadays she’s being faced with the reality that her three oldest girls may not want to spend their entire lives’ on camera any more and as they begin to take control Kris is resorting to drinking binges. According to the latest Star Magazine, Bruce Jenner is beyond fed up with his wife’s lies and shady behavior- so much so that he has already had divorce papers drawn up. They have yet to be served but knowing Bruce, the next time something happens that causes him to blow his top Kris will likely be getting a knock on her door. Whether or not she’ll answer is another story. According to sources close to Kris she is often passed out by 5pm! If you’ve tuned in to watch Keeping Up with the Kardashians then you probably have seen Kris face down drunk after tripping over her own feet. She has obviously had a problem for a long time. Also in the latest Star you can read the about the guy that Miranda Lambert left in order to have a real relationship with Blake Shelton. With all of the rumors of his infidelity and DL relationship with Cady Groves I have to wonder if she would have been better off with the other guy! Nicole “Snooki” Polizzi has garnered lots of publicity lately for losing all of that baby weight that she put on while carrying baby Lorenzo. Do you think she has gone too far? Some are starting to question whether or not the reality star may find herself battling an eating disorder again. It wouldn’t be the first time, as she has admitted to having food issues while back in high school. Is she fast tracking towards another problem? Tell us your thoughts in the comments below!